High-performance unit (up to 400 kHz throughput) featuring 4 input channels (BNC and Pod Port DIN connectors), an analog output for stimulation or pulse generation, a trigger input, digital inputs/outputs for external instrument control, High-Speed USB 2.0 interface. High-performance unit (up to 400 kHz throughput) featuring 8 input channels, an analog output for stimulation or pulse generation, a trigger input, digital inputs/outputs for external instrument control, High-Speed USB 2.0 interface. Purchase of PowerLab 35 units with Chart Pro includes 5-years of FREE Chart Pro upgrades/updates and all avaliable modules. The PowerLab 16/35 is a high-performance data acquisition system suitable for a wide range of research applications that require up to 16 input channels. Typical applications include human and animal physiology, pharmacology, neurophysiology, biology, zoology, biochemistry, and biomedical engineering. The unit is capable of recording at speeds of up to 400 000 samples per second continuously to disk (aggregate), and is compatible with instruments, signal conditioners and transducers supplied by ADInstruments, as well as many other brands. In addition to standard single-ended BNC inputs, the PowerLab 16/35 features 4 differential Pod ports that allow for direct connection of Pod signal conditioners and appropriate transducers. A freely available software addition to LabChart. It allows a selected range of Wire Myograph and Tissue Bath Systems to stream data directly into LabChart without a Powerlab box. The DMT Normalization Module is used when performing in vitro experiments on isolated vessels with Wire Myographs. The module is used to calculate and set the optimal pretension conditions for microvessels or other tubular tissues prior to commencing experiments. 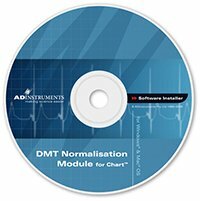 The DMT Normalization Module for Windows provides an easy method for the calculation of optimal pretension conditions for microvascular or any small tubular tissue research. The module provides an easy method for calculation of pretension conditions any small tubular tissue (up to 500μm) research.